In researching my great-great-grandmother’s former beau, John William Tolleson, I was most interested to discover some of his family members living today are genealogists. My grandfather’s cousin Mary had some letters that she believed were from John William Tolleson; however, once she took them out of storage, she realized they were actually from Roscoe M. Payne. It turns out that my great-great-grandmother Stella was popular! After reading the letters, I can verify that Stella was, indeed, engaged to Roscoe M. Payne. It seems that their falling out had something to do with his running a pool hall, which was associated with other vices such as alcohol; however, it is not clear (and he vehemently denies) that Roscoe M. Payne himself had a drinking problem. As with John William Tolleson, I was able to discover at least one genealogist related to Roscoe M. Payne, with a Family Tree Maker website. It was last updated two years ago, but I will try to contact the page’s owner, Ora Mae Byers. If you are descended from Roscoe Payne or related to him, I would love to hear from you. I located Roscoe M. Payne in a One-World Tree family tree. A caveat: information in these trees varies from the precisely accurate to the totally inaccurate, depending upon the genealogist compiling the information. It would appear that the genealogist(s) concerned with this branch of the Payne family descend from Roscoe’s sisters Terry Alberta Payne and Belle Payne. According to this family tree, Roscoe Miller Payne was born January 20, 1864 in Texas. His father was Jones William Payne, who was born August 6, 1830 in Bridgeport, Jackson County, Alabama, and his mother was Harriet Smith, who was born July 19, 1834 in Smithfield, Henry County, Kentucky. They married in Rockwall County, Texas on April 29, 1855. I verified this information through Ancestry.com‘s U.S. and International Marriage Records, 1560-1900. One curious coincidence: Stella’s father was named William Jones Bowling and her beau Roscoe’s father was named Jones William Payne. Stella had an aunt named Panthea Kennedy who married a George Payne. I do not know if he is related to Jones William Payne, but according to the family tree I found, he does not have a brother named George. However, I must emphasize again that the accuracy of these trees varies widely, and often researchers do not include family members from whom they do not descend. December 10, 1893: Wrote to Rosco. January 19, 1894: At noon came up to house & had two letters one from Rosco other from Edna. January 20, 1894: Rosco came down to Aunt P. and invited us to a party at Mr. Payne’s [this is probably Jones William Payne]. February 4, 1894: Finished my letters to Edna and Rosco and wrote one home. February 14, 1894: Valentine’s Day, I received a letter from Rosco, one from Mary Hutton & one from Annie Price. March 4, 1894: Wrote a letter home & one to Rosco. March 28, 1894: Wrote to Rosco and told of my going to marry. April 24, 1894: Wrote to Rosco and started to write to Mary but did not finish. May 25, 1894: Got a letter from Rosco. June 5, 1894: I got a letter from Sarah Buster & one from Rosco they [the letters] had been sent to Allen. Though the spelling Stella uses is different from that used in records I found, I believe this is probably the same person. Stella was inconsistent with spelling (and, indeed, so are many official records of the era). I do find it interesting that Roscoe visited Stella’s aunt Panthea Kennedy Payne with an invitation to a family at Mr. Payne’s house. I do believe there may be a connection between Roscoe’s family and Panthea’s in-laws, but I do not know what it is just yet. From this census, we learn that Roscoe Payne was 54 years old, owned his home on Fannin St., and was a Real Estate Agent. His father was born in Alabama, and his mother was born in Kentucky, but he himself was born in Texas. This means that his family came to Texas relatively early. Roscoe’s wife Lula was 48. She was born in North Carolina, as were both of her parents. Roscoe and Lula had two sons living with them — Frank, who was 17 and a clerk, but I cannot read the type of workplace, and Jimmie, who was 12. Both children were born in Texas. In 1910, we find Roscoe Payne and family in the same town and county. He is not yet on Fannin St., but must be nearby, because Fannin St. families appear just before families on his street in the census. The name of Roscoe’s street is indecipherable, but starts with San–. From this census, we learn that Roscoe is 45. 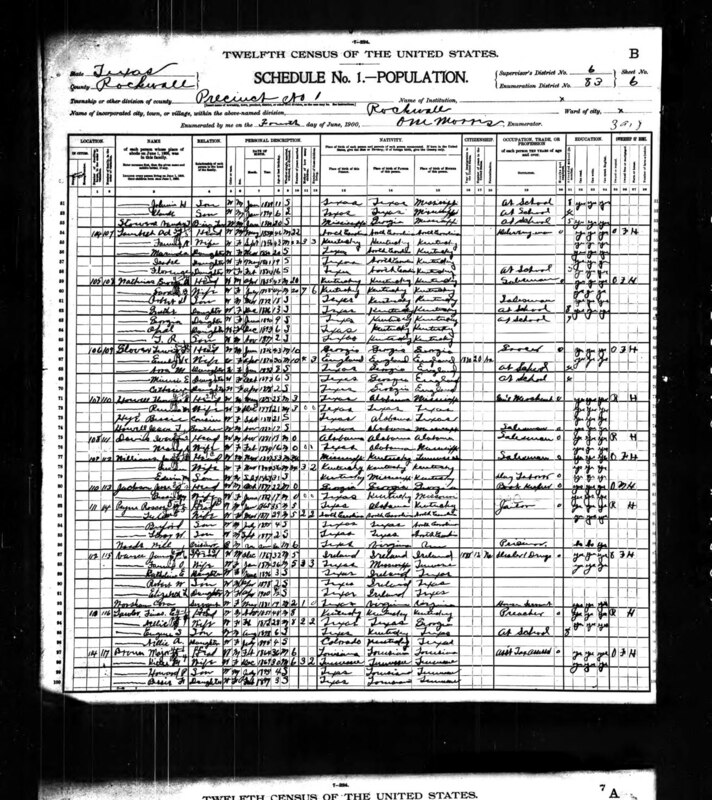 His birthplace and parents’ birthplaces are the same as on the 1920 census, but it appears the census-taker originally wrote “Pennsylvania” for his father’s birthplace and wrote “Alabama” on top of it. His occupation as listed on this census is Deputy Sheriff for Rockwall County. All of the children were born in Texas. I think it is safe to assume that these four children are the four surviving children referred to on the census. Interestingly, two prisoners were enumerated with Roscoe’s family: Dee Pipes, a black male, age 30, who was married, born in Texas, parents born in Texas; and Maynard Abe, a white male, age 65, single, born in Texas, parents born in Texas. Also interesting is that Roscoe Payne’s neighbor is a Real Estate Agent. Could his neighbor have convinced Roscoe to give this career a try after his tenure as Deputy Sheriff ended? In 1900, we find Roscoe and family in the same town and county. Once again the Paynes have a prisoner enumerated with their household: Will Woods, a black male, born unknown, married for 6 years, born in Texas, father born in Virginia (mother’s birthplace unknown). The 1890 Census is unavailable. 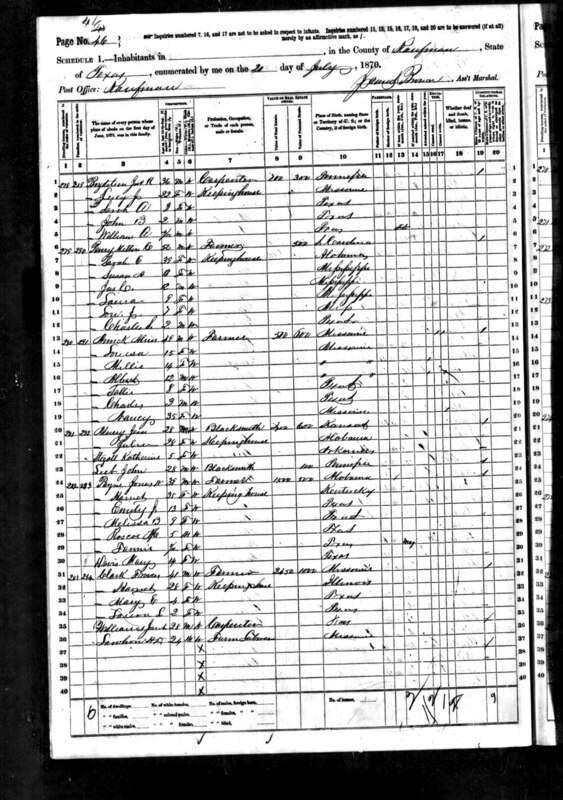 Jones W. Payne and his family appear in the 1870 Census of Kaufman County, Texas. Jones W. Payne is 39 and a farmer. His real estate was valued at $1500 and his personal real estate was valued at $500. He was born in Alabama. His wife Harriet is 35 and born in Kentucky. A note about the different spellings of Harriet’s name: I am not sure whether it is correctly spelled with one “t” or two, but such errors are relatively common in historical records. I transcribed the spellings used in the records. I have learned not to be bothered by such inconsistencies in historical records. 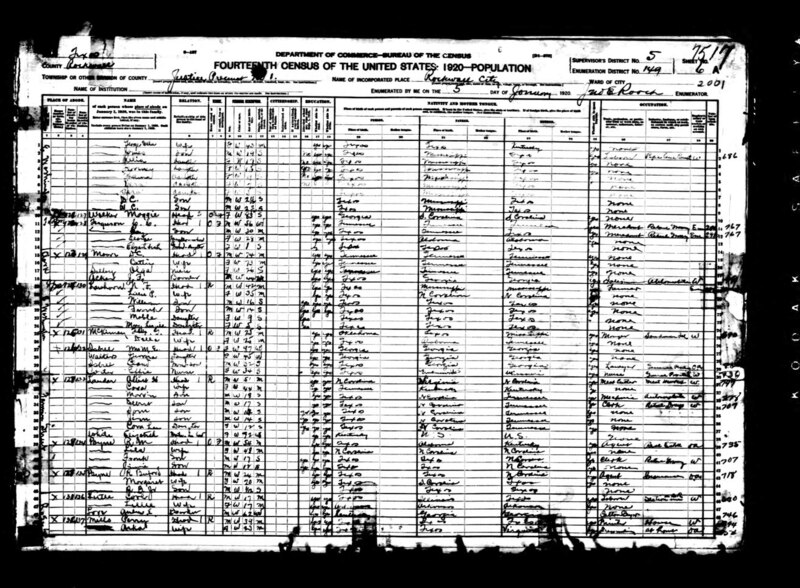 According to this census record, Jones and Harriet Payne had been married 53 years. Their probable year of marriage according to this record was 1857. 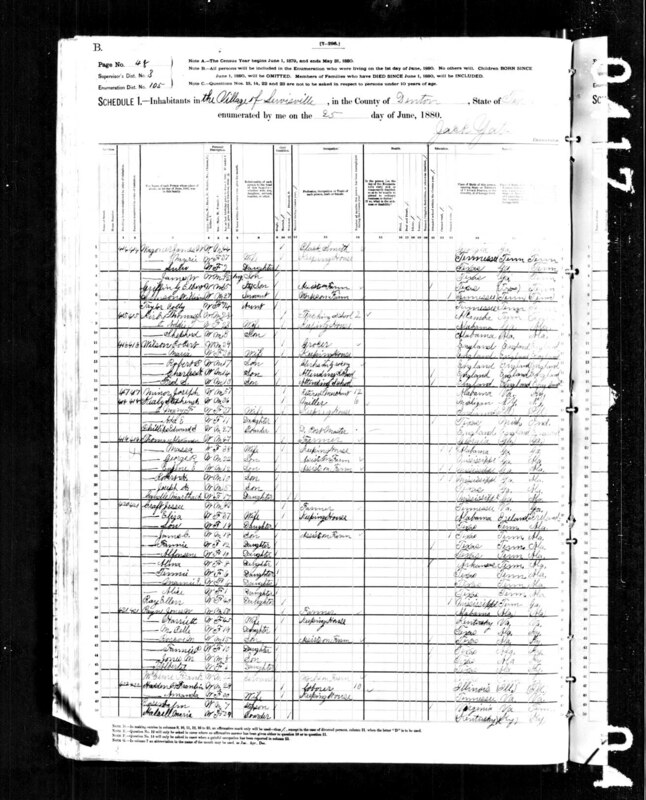 If the 1857 date is correct, it would seem that the dates on the other census records indicate a blended family, with Emily J. Payne possibly being their first child together. 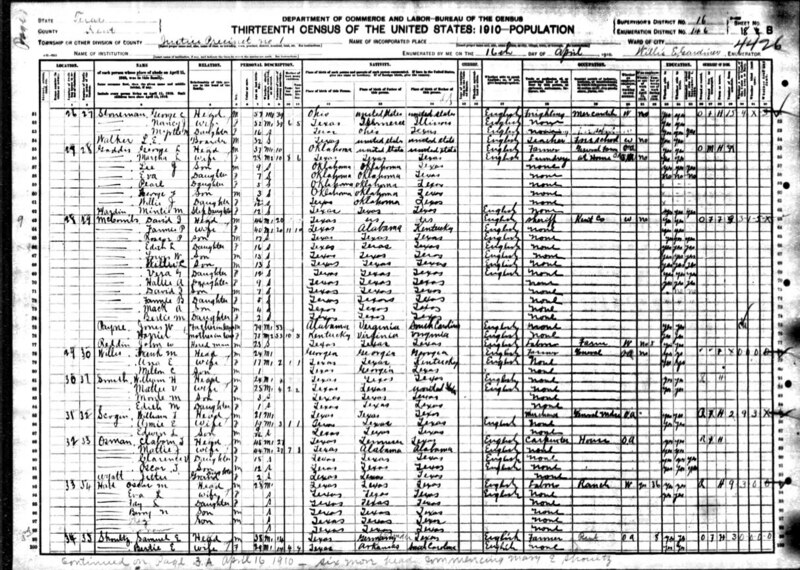 At any rate, the 1910 census does indicate that Harriet Payne’s marriage to Jones is her second, while it is his first. Harriet gave birth to 10 children, 5 of whom still survive in 1910. According to Ora Mae Byers’ website, Roscoe Miller Payne died June 6, 1930 in Abilene, Taylor County, Texas, which may explain why I didn’t find him on the 1930 census. Byers believed his wife’s maiden name to be Lula Ellen Holt. I can find no reference to a Lula or anyone surnamed Holt in Stella’s diary. 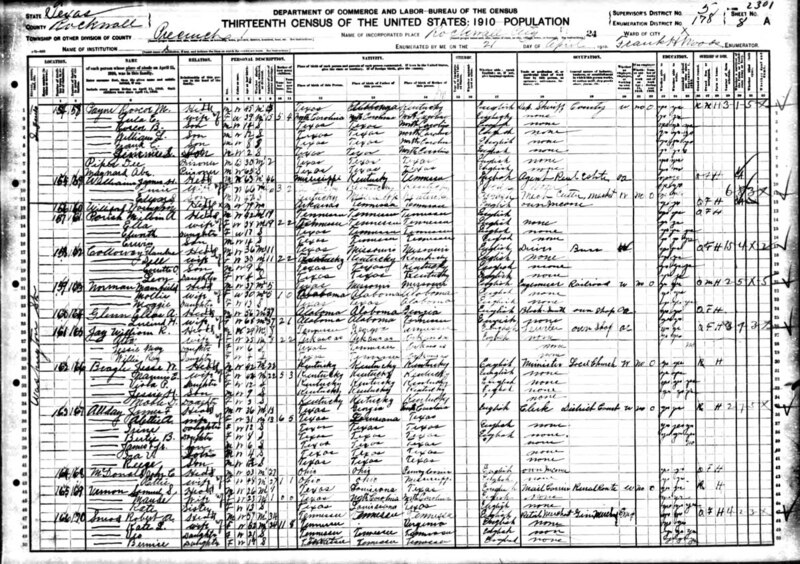 I believe that I have identified all of my great-great-grandmother Stella’s fiancés at this point, and I must say, learning more about her life before my great-great-grandfather Amos Cunningham has been very interesting, and I want to thank my grandfather’s cousin Mary and fellow genealogists (not to mention Ancestry.com) for making my search so fruitful. One thing to note regarding the 1870 census of Kaufman County. Keep in mind that Rockwall County was not formed until 1873 by the Texas Legislature from part of Kaufman County. It would be possible to appear as a Kaufman County resident in the 1870 census but as a Rockwall County resident in subsequent enumerations while remaining on or near the same homestead. I am a descendant of Melissa Belle Payne. She was my great-grandmother on my maternal grandfather’s side. The Payne family is quite extensive. Melissa Belle had at least 9 siblings. Her family founded the town of Rockwall, Texas. Dana: Roscoe M Payne was my grandfather, and what you have written about him seems accurate. One of the few things I can add is that the black prisoner Will Woods must have stayed much longer than the census records indicate. My father, Jimmie S Payne, told me stories of how “Old Will” made kites for him, his favorite being a “singing kite.” As my father was born in 1907 it seems Will must have stayed with the Payne family at least through 1917. My father made it clear that he was very fond of Will. Jimmie, it’s great to hear from you and thanks for sharing these additional stories.